When Germany surrendered to the Allies in May 1945, one of the immediate tasks for the victorious allies was dismantling the Nazi Wehrmacht. 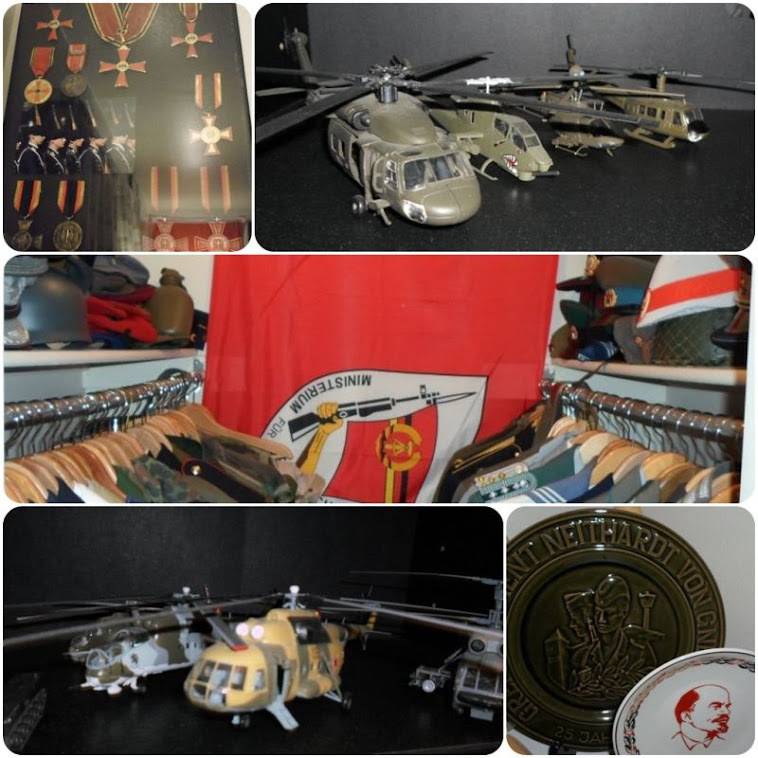 General aviation was severly restricted and military aviation was forbidden. The Luftwaffe was disbanded in 1946 by the Allied Control Commission. When the process for rearming West Germany began in 1955, the Navy was the first to be stood up and then the Army & Air Force. The largest problem Germany faced when establishing her Air Force was the time lapse. Her veteran Luftwaffe pilots had been out of the cockpit for ten years. In the ten years since the end of World War II. Aviation technology had seen enormous advances. Many veteran fighter pilots who had fought with Herman Göering's World War II Luftwaffe joined the new post-war air force and underwent refresher training in the United States before returning to West Germany to upgrade on the latest American equipment. Among the veteran Luftwaffe pilots to join the postwar West German Luftwaffe were Erich Hartmann, the highest ever scoring ace in aerial combat (credited with 352 enemy aircraft destroyed), Gerhard Barkhorn (301 enemy aircraft destroyed), Günther Rall (275 enemy aircraft destroyed) and Johannes Steinhoff (176 enemy aircraft destroyed). Steinhoff, who suffered a crash in a Messerschmitt Me 262 shortly before the end of the war which resulted in lifelong scarring of his face and other parts of his body, would go on to become the Commander in Chief of the Luftwaffe, with Günther Rall as his successor. 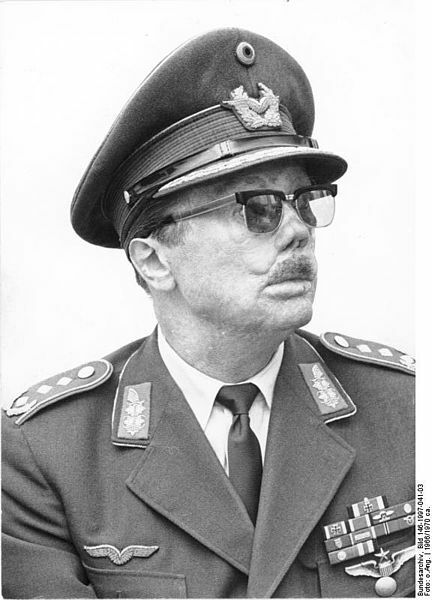 Josef Kammhuber also served in the post-war Luftwaffe, retiring in 1962 as Inspekteur der Bundesluftwaffe (Chief Inspector of the Federal Air Force). West German Luftwaffe uniforms were blue with yellow insignia and were closely modeled on those worn by the Luftwaffe personnel of the Second World War. 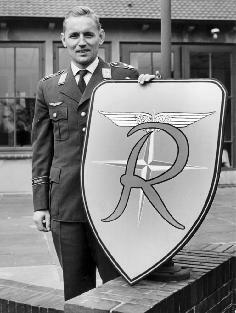 Unlike the Heer, the Luftwaffe did not use specific waffenfarbe to distinguish its personnel instead using a system of Tätigkeitsabzeichen or Specialty Badges worn over the right breast pocket to distinguish it's personnel. The uniform displayed here is the early era Grundform des Dienstanzugs Luftwaffe (Basic Service Uniform of the Air Force) for an Air Force Oberstleutnant (Lieutenant Colonel). The uniform jacket depicted is of the standard Air Force blue color with the yellow gold colored piping of the Air Force adorning the shoulder boards and collar insignia. It also adorns the legs of the uniform trousers. The visor cap is of Air Force blue with silver piping common of all officers below the rank of General, there are silver oak leaves on the visor itself signifying position as a senior ranking officer. The emblem of the Luftwaffe with wings emcompassed by a wreath rests in the center of the hat and the German national roundel emblem is positioned above that. The collar insignia closely resemble those of World War II era Luftwaffe personnel but feature wings; the emblem of the Luftwaffe encircled by a wreath. 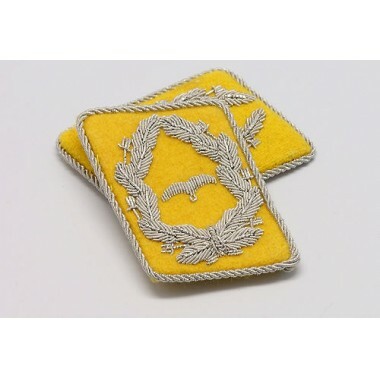 Shoulderboards of the Luftwaffe are lined with the yellow gold piping of the Air Force and on the example shown here display the rank of Oberstleutnant (Lieutenant Colonel) with two silver pips and a wreath at the base. The red, black and yellow colored band at the base of the board signifies the wearers position as a Reservist. Note the early style uniforms of the Air Force also retained the French style cuffs on the sleeves of the tunic. Also worn on earlier uniforms were the cuffband insignia of the Luftwaffe, with a pair of wings in white superimposed against a black background. Up to 18,650 lb (8,480 kg) of weapons on nine external hardpoints, including general purpose bombs, cluster bombs, TV- and laser-guided bombs, rocket pods, air-to-ground missiles, anti-runway weapons, anti-ship missiles, targeting pods, reconnaissance pods, and nuclear weapons. Baggage pods and external fuel tanks may also be carried.